For June, Miller IDS turns its monthly Featured Artist focus on Chris Celusniak, a true storyteller through his intricate artwork. Chris’ art shows a hidden depth of stories within stories that come together to create the whole picture. The eclectic works derive their form from patterns, improbable vintage, and a world of endless color. Viewers look into the canvas and find the intimate spaces within the larger whole, to read the narrative of its inhabitants, each with a story to tell. Chris works to create a window on a feeling that both he and the viewer may share. Recognized with multiple awards, Chris has exhibited across the country. The native Texan was born in Houston, is a member of the San Antonio River Art Group and now lives in Austin with his family. 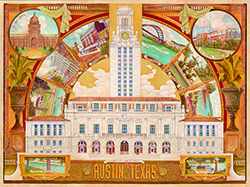 We will have a print of Chris’ Austin-Texas hanging in both our downtown and north stores for the month of June and hope you’ll come by to check it out and/or visit his website to see more.